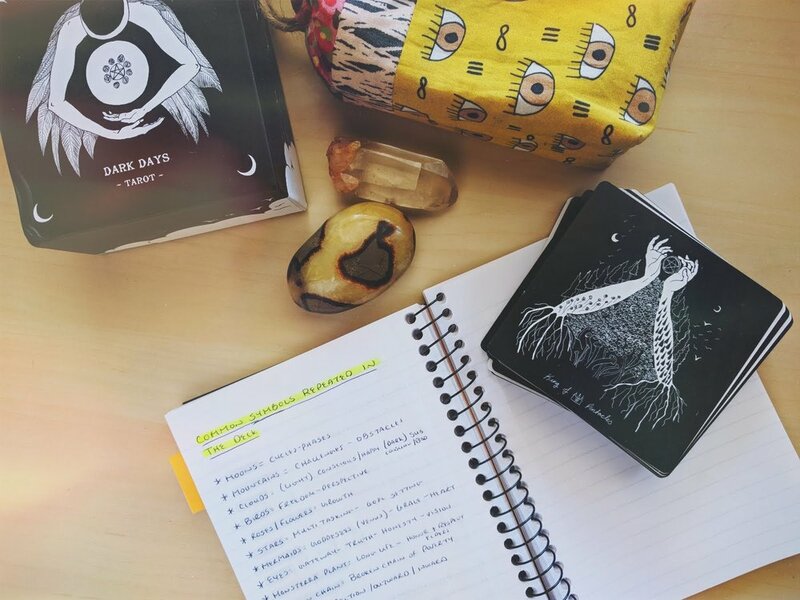 Whether you’re new to tarot or well seasoned, you’ve probably heard others recommend keeping a tarot journal over and over again. I’m part of that group as well! Keeping a tarot journal is one of the most effective ways in learning tarot, connecting with the cards, and even just getting familiar with a new deck. 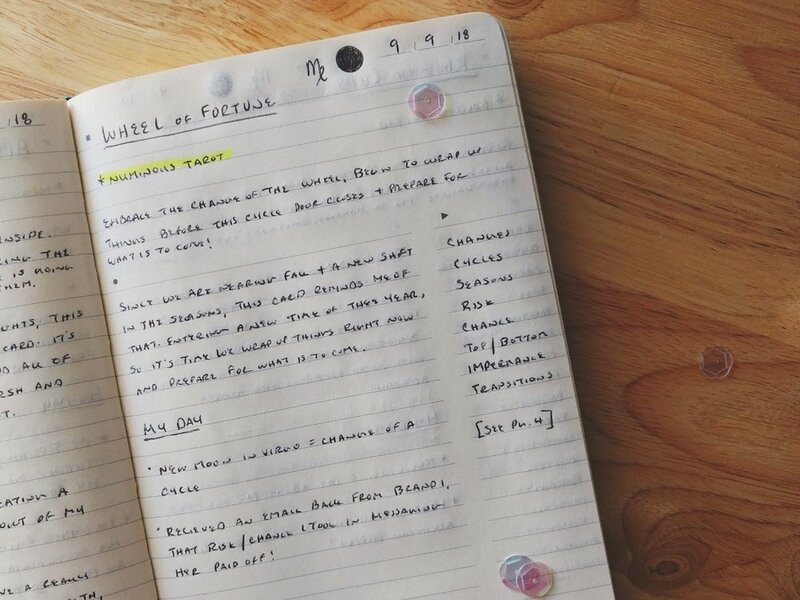 For most of my own tarot practice I’ve kept a tarot journal and it wasn’t until fairly recently that I discovered a tarot journaling system that works for me! 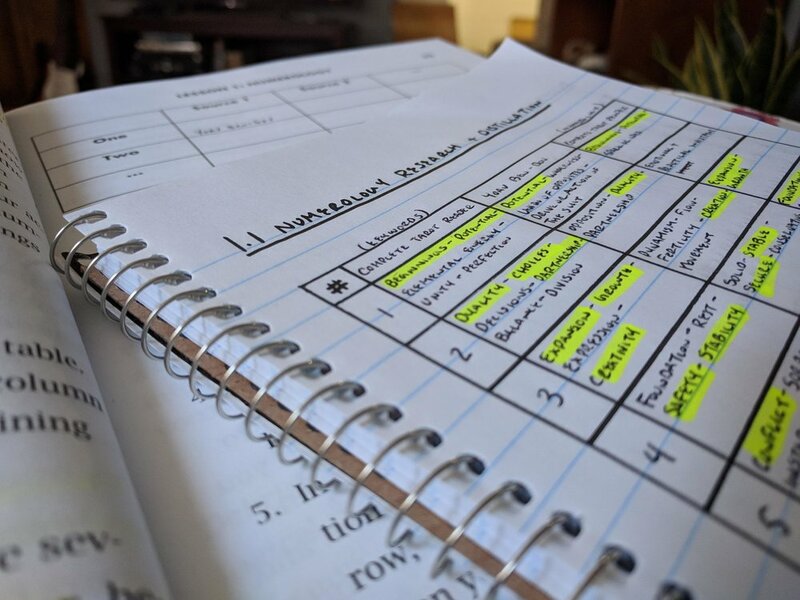 While I do sway back and forth between this journaling system and my composition books, I love using this journal for most of my study! Every journal I have ever kept always has some collage pages or images that I glue down that inspire me. I collage everything! Above is the inside front cover of my tarot study journal (the one I’m discussing today on the blog) and I’m still adding to these pages as time goes on. Most of my journals in general are cheap composition books, but one tarot journal is a Moleskine Professional Notebook and have found it works really well for tarot journaling and study! This journal features an index up front, numbered pages, tear out list paper in the back, as well as a folder/pocket combo on the inside back cover. What I like most about this journal in general is the page layout of the journaling pages, this is where the magic happens! Each morning I do a daily single card draw. At the top of the page I fill in the date and I write down the moon phase with current astrological sign. I use a full moon stamp for my moon and just fill in the phase, it’s easier and quicker that way. I’ll also write the card name at the top of the page and note the deck I used. Writing down the deck you use is a good way to keep track of why you read a certain card the way you did, sometimes the same card can read differently from deck to deck. Next, I move on over to the list column on the side. I start writing down the keywords that I have for the card drawn starting with any keywords that I personally associate to the card, once I run out of my personal keyword associations I’ll pull up an app, book, or online reference to find more keywords that resonate with me. Some card keywords don’t feel right so I don’t use them, I only use keywords that I resonate with. My keywords may differ than your keywords and that’s totally ok! If I pulled the same card earlier in my journal, I’ll write down “see page…” to note the other page this card was referenced. Sometimes I used different keywords and it gives me a nice way to follow the card over time, it’s like creating a “family tree” for this card. It just seems really repetitive to write down the keywords every time you pull the same card, especially if it’s a card that keeps popping up for you. Then, I’ll move over to the center note area and this is where I write down a paragraph or so of what this card means to me at this very moment, like a journal prompt. This isn’t the interpretation per se, this is more of how I associate to this card, a memory attached to this card, etc. It’s the “exploration” area for this card. Maybe some of the colors in the card remind me of an event or a symbol in the card catches my attention, I’ll write all that down. Once I finish writing that, I then jump to the top of the page and write down my rough interpretation of the card for the day. If you follow my daily readings on Instagram, this is where I write down the starting point of those readings. Lastly, I write “My Day” in the center section, just under my personal journaling of the card. This is where I write down little things in my day that remind me of the card I drew that morning. Maybe I pulled the 2 of Coins and I found myself reorganizing my planner that day (prioritizing) or maybe I found two quarters on the sidewalk (literally, 2 coins), and so on. If I carry my journal with me, I tend to write down a lot more notes about my day and that card drawn. Otherwise, I just take a moment in the evening to pinpoint anything that may have happened or appeared in my day that reminded me of the card I drew. This little exercise in general really helps to expand your interpretations of the cards by associating them to your day to day life. So if a certain card shows up in a reading, you may recall a specific memory that could be applied to the reading or help trigger a new interpretation. That’s it! 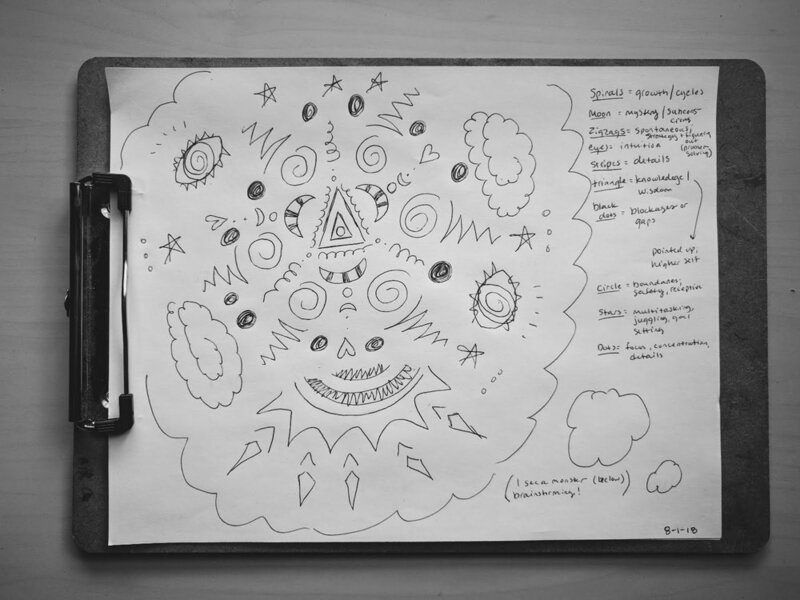 That is how I use my daily journal for both journaling and tarot study. It’s a nice way to have all your notes, thoughts, personal associations, and memories all in one place that is well organized and easy to carry with you. I journal so much more in this journal than in previous journals, something about looking at a totally blank page never did it for me. I would often skip writing things down or never get around to noting down my tarot readings and daily pulls. Having a page that is broken up into more “fill in” friendly spaces is inspiring and fun! I hope this little post was helpful and inspires you in your own tarot practice! Do you keep a tarot journal? Let me know what works for you, I’m always looking for new ideas!